Best Samsung Galaxy Recovery Software, recovering pictures in 3 Steps! Samsung Galaxy Recovery Pro is totally safe and easy. There are seldom technical terms in the dialogs. You need not to have in-depth knowledge of computer to perform card recovery. The only thing you need to know is which module to use according to the kind of cell phone data loss. Samsung Galaxy Recovery Pro performs read-only operations on your different brands of cell phones, and saves the recovered pictures to your hard drive. Samsung Galaxy is very famous among so many cell phones. It is popular as the beautiful appearance and powerful functions. But it is also prone to having their data become corrupted without warning. All hard devices have this kind of matter. Then how to retrieve the lost of Samsung Galaxy? The quicker you perform card recovery, the better chance you will get your files back. Once your Samsung Galaxy card is overwritten, you will lose the chance to recover files from card forever. So you must stop using Samsung Galaxy immediately when the accident happens and hurry up to try our free card recovery software to recover your memory card. Samsung Galaxy Recovery Pro is your first and best choice. 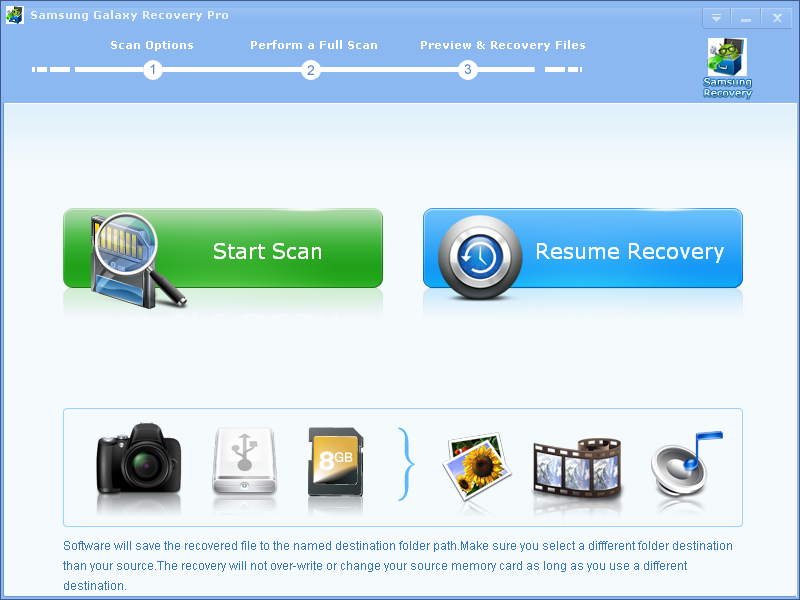 Samsung Galaxy Recovery Pro is a FREE, fast and safe solution for your lost data recovery from Samsung Galaxy. 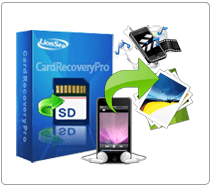 This free card recovery software provides easy and quick data recovery solutions to recover lost files from any memory card. It supports almost all brands of cell phone including HTC, Nokia, Motorola and more. Generally, if the lost data on the Samsung Galaxy is not damaged or overwritten, Samsung Galaxy Recovery Pro will help you to recover it and get all your precious photos and files back. Samsung Galaxy Recovery Pro can retrieve not only the universal cell phone card (microSD card) but also other memory cards such as Compact Flash card, CF Type I, Type II, MicroDrive, CF card, Memory Stick, Memory Stick Pro, Duo, XC, Micro (M2), MultiMedia card, MMC card, SmartMedia, flash card, xD Picture card, etc. Samsung Galaxy Recovery can undelete all daily files, data, but also images, pictures, music, audios and videos with almost all kinds of formats: PNG, INDD, JP2, PSD, Paint Shop Pro Image File (PSP) for picture; M4P, RPS, AIFF, M4A, AU, OGG, WMA, RM, Real Audio (RA) for audios; DV, M4V, 3G2, M4B, AVCHD Video File (MTS), Divx Encoded Movie File (DIVX), Matroska Video File (MKV), MOI Video File, OGG Media Player (OGM), Video Object File (VOB), 3G2, ASX for videos. * Samsung Galaxy Recovery Pro will undelete all type of photos from your SD card or disk.